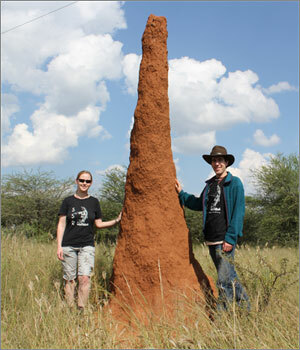 (CAMBRIDGE, Massachusetts) — On the plains of Namibia, millions of tiny termites are building a mound of soil_an 8-foot-tall “lung” for their underground nest. During a year of construction, many termites will live and die, wind and rain will erode the structure, and yet the colony’s life-sustaining project will continue. Inspired by the termites’ resilience and collective intelligence, a team of computer scientists and engineers at the Harvard School of Engineering and Applied Sciences (SEAS) and the Wyss Institute for Biologically Inspired Engineering at Harvard University has created an autonomous robotic construction crew. The system needs no supervisor, no eye in the sky, and no communication: just simple robots_any number of robots_that cooperate by modifying their environment. 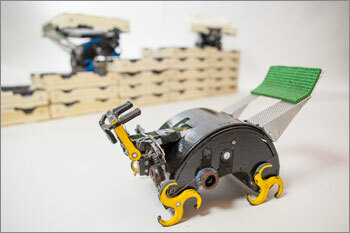 The TERMES robots, developed at Harvard, act independently but collectively. Credit: Eliza Grinnell, Harvard SEAS. Coauthor Kirstin Petersen, a graduate student at Harvard SEAS with a fellowship from the Wyss Institute, spearheaded the design and construction of the TERMES robots and bricks. These robots can perform all the necessary tasks_carrying blocks, climbing the structure, attaching the blocks, and so on_with only four simple types of sensors and three actuators. Notes to reporters: High-resolution photos are available upon request. To read the paper, contact the Science press package team at (202) 326-6440 or scipak@aaas.org. The Wyss Institute for Biologically Inspired Engineering at Harvard University http://wyss.harvard.edu) uses Nature’s design principles to develop bioinspired materials and devices that will transform medicine and create a more sustainable world. Working as an alliance among Harvard’s Schools of Medicine, Engineering, and Arts & Sciences, and in partnership with Beth Israel Deaconess Medical Center, Brigham and Women’s Hospital, Boston Children’s Hospital, Dana Farber Cancer Institute, Massachusetts General Hospital, the University of Massachusetts Medical School, Spaulding Rehabilitation Hospital, Boston University, Tufts University, and Charité – Universitätsmedizin Berlin, the Institute crosses disciplinary and institutional barriers to engage in high-risk research that leads to transformative technological breakthroughs. By emulating Nature’s principles for self-organizing and self-regulating, Wyss researchers are developing innovative new engineering solutions for healthcare, energy, architecture, robotics, and manufacturing. These technologies are translated into commercial products and therapies through collaborations with clinical investigators, corporate alliances, and new start-ups.